I love it that God has a plan for my life, and only reveals one day at a time, in the correct sequence. In yesterday’s post, I tried to articulate the loss of a sense of place that has resulted from the destruction of so many massive, old, beautiful trees in our yard, neighborhood, and city. Last night in a women’s Bible study, video teacher Jennifer Rothschild taught a class from her study entitled Missing Pieces: Real Hope when Life Doesn’t Make Sense. She talked about having “holes” in our “faith blankets”: circumstances so hard that we may question or doubt the goodness of God. Jennifer, a gifted songwriter and singer, as well as Bible scholar and teacher, lost her sight when she was 15. That was a BIG opportunity to find a hole in her faith blanket, but she chose to use her gifts to glorify God anyway, and is still doing that, 30 years later. I was reminded last night that I have friends who have lost their husbands, homes, marriages, sobriety, dreams of a partner or children, and parts of their bodies in order to survive cancer. Yesterday afternoon I thought I needed to give myself permission to grieve the loss of a significant part of my visual context, represented by the fallen trees. Last night I was reminded that the grieving for any material thing needs to be intentionally experienced in the context of my spiritual worldview. Trees are beneficial in many ways, and for an extremely visual person like I am, my surroundings and ambient light impact my productivity and enjoyment of my space. But I needed a good reminder that THIS world is not my permanent home, God both gives and takes away for our ultimate good, and I need to be getting on with life–and grieving for the maple trees– intentionally prioritizing eternal values. Thank you, Jennifer Rothschild! This entry was posted in Uncategorized on July 29, 2015 by lrmayfield. The brown mass next to the heaved sidewalk slab in the photo is the underside of the root ball of a massive maple tree. It had stood in front of our house for more than 120 years. The tree fell east, away from where I took the photo, and still lies across parts of our yard and two neighbors’. The storm that felled it hit two weeks ago last night, but only today did the city address that big tree trunk, and then only to cut it into logs, not remove it. It’s taking weeks just to deal with the immediate damage. Neighbors still start our conversations with animated descriptions of damage, and are sometimes almost in a “Can you top this?” mode when we describe our losses. We’re very much in the present: “There’s still a branch across my porch.” “I’ve ordered new shingles for my roof.” “I still haven’t found my lawn furniture.” After covering all those bases, we sometimes confide, almost guiltily, that we notice some strange things in our own thoughts and behaviors. To some degree, at some point, most of us have experienced shock. We have a visceral reaction each time we see the tree that shaded our home, our kids, and our grandkids, lying in the street. We do illogical things like trying to move branches that obviously will require machinery to even budge. We study the cavernous holes the root balls left when they were wrenched from the ground, as if staring could reverse the occurrence. We are surprised that day after day, more loosened twigs and branches tumble onto the yards, like guests arriving very late for the party. Then we tentatively begin to speculate on the changes that the tree losses have brought. in our perceptions of our surroundings. No lush canopy provides shade or protection in places that have always enjoyed both. If the breeze is brisk, I’m afraid to tend my gardens under the big trees that are left. It there is any breeze at all, I don’t let my grandchildren play in their shade. Will I be able to rock and read on my front porch again? I don’t know. The 1000+ workers who came in to help restore power and move debris cannot fix everything. Of the original 12 maple trees in the strips of tree lawn between our sidewalks and the streets on our corner, three remain. The trees were so much a part of the inside ambiance of our home that I have only wood blinds on the bay window in our south and west-facing bedrooms upstairs and the picture window in our living room, because the spectacular views were straight into the maple branches. Losing the trees did not just affect how the outside looks, or the eventual market value when we sell someday. The very light in which we live is different, the views from our windows are different. Now we will need to close those blinds for privacy. The storms of life often leave evident, immediate, painful damage. We use trite phrases like, “Pick up the pieces and move on.” It’s as if it’s a demonstration of some sort of character, strength, and courage to do that as quickly as possible. But collateral damage, physical, emotional, and even spiritual, is just as real, and just as painful, and lasts a whole lot longer than the shock of the traumatic event does. After a windstorm or a personal storm, I want to allow myself time to grieve the changes and not feel weak or guilty for doing it. A part of the process needs to be hope, and the hope needs to put out some tentative tendrils, like the morning glory vine that keeps emerging from my flower bed of zinnias–all little plants that came through the big storm quite well. I need to be looking for the place I’ll thrive, even if the protective and comfortable shade to which I’m accustomed is no longer there. I need to begin planning for the good that’s going to happen in sunshine. I have laid out a place for a huge shade garden under the dogwood that is sheltered between our house and our neighbor’s. My husband bought me my own mattock to dig the trench for the brick liner, and I bought bags of red mulch for the ground cover. Those hostas and hydrangeas with the brown sunburned spots and crispy edges on their leaves from losing their shade can thrive just as well under a dogwood as they did under a maple, and digging in the dirt to re-set them in a different perennial shade garden will do me good. A lot of good. This entry was posted in Uncategorized on July 28, 2015 by lrmayfield. I live in a Midwestern neighborhood of big, one-of-a-kind red brick homes built in the 1890s, with lawns framed by city sidewalks and tree lawns between the sidewalks and the curbs. Apparently, maple trees were planted every 15′-20′ when the houses were built, because we all have magnificent, towering maple trees that give us deep-to-dappled shade on our yards and homes. I live on a corner, so we have rows of those trees on both sides of our lot. Those trees are some of my favorite things about where I live. On July 13, 2015, at 6:20PM, a storm swept through my hometown with typhoon-force winds. I can now stand in the street corner of my front yard and count five of those majestic maples that are down. The one in front of our house fell almost due east and filled Oak Street from our house to our neighbor’s two doors up. Across 14th Street to the west, our neighbor’s tree fell due south, completely blocking Oak and reaching all the way across the front yard to the very doorstep of the house on the south side. If I look north, I see a tree snapped like a match stick, with an ugly spike piercing the sky, and the gigantic trunk with all its branches and leaves bisecting my neighbor’s 2-1/2-car garage. The east and west walls blew outward. Her car is still in it. A little farther, another went down from the roots, fell east, took out part of her balcony, and lies across her yard. 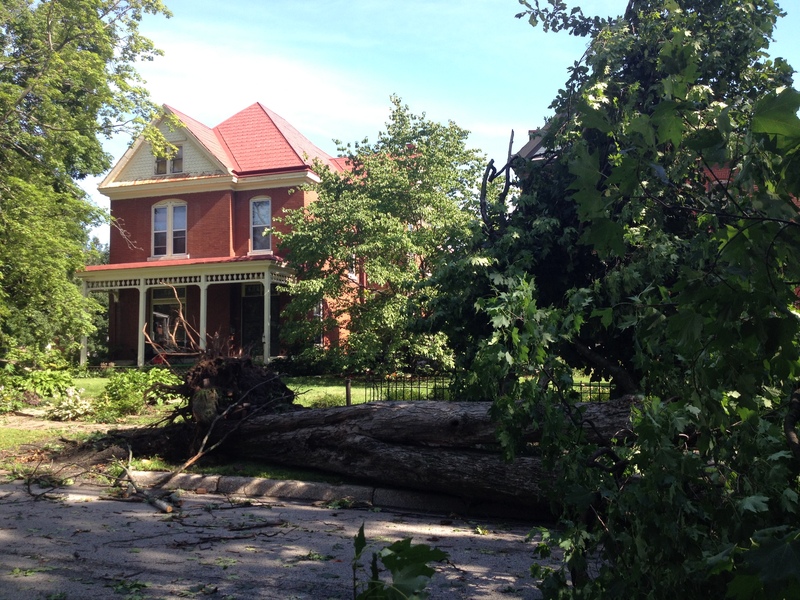 A bit farther yet, another is uprooted and smothers her front yard and front porch with branches and leaves. So much damage was done in the city that more than 1000 workers have come from hundreds of miles away, and crews will require weeks to clean up the mess; but after the trunks and twigs are gone, our neighborhood will never look like it did before July 13. Neither we nor our children will live to see the new trees we plant become 123-year-old giants like the ones that fell. The green tunnels over the streets are gone. My shade gardens are no longer in the shade. The hosta leaves are already burning to a crisp beige, the green leaves of the columbine have turned to the color of blood, and the hydrangeas have drooped. Our visual context has irreversibly changed. Normal will forever look different from the way it was–the way we wanted it to look, and the way arranged our lives and environments around. And we are grieving the loss. This entry was posted in Uncategorized and tagged trees on July 21, 2015 by lrmayfield. Who are you? Who am I? I think we all appear to be different people in different contexts, and the difference is often not only the perception, but the reality. We project an image of who we are, and others perceive the image from their own contexts. Some of the perceptions will be solid and real, some will be a little rusty compared to how they once were, and some will just be shadows of the reality. We make choices about how we will present ourselves, what we will say or write, and how we respond or react to the elements in the context we enter, whether people, objects, or the environment in general. We disregard or ignore differences in context at our own risk: they enrich our understanding. When communicating who we are is limited to words on a page or screen, many dimensions are eliminated. The words become more important. Their purpose is to communicate, and there is power in the communication. Words can be chosen to inform, challenge, encourage, or deceive. My hope is that the communication on this web site will be reciprocal, thoughtful, intentional, kind, and edifying. Let’s bring each other into our own contexts using well-chosen words. This entry was posted in Uncategorized on July 1, 2015 by lrmayfield.